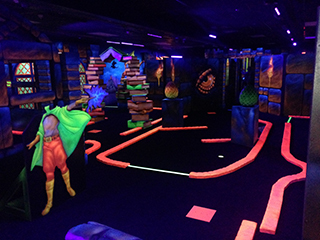 A new interactive glow golf experience. Choose your putter and step into the distant past. 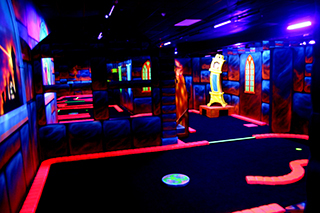 The Dark Tower glow golf experience puts you in ancient castle passageways surrounded by glowing dragons, knights, cauldrons, and bubbling elixirs. Compete with your family and friends to see who can best master the mysteries of The Dark Tower holes. Play a round of mini-golf anytime. Make an afternoon of it and combine a round in the Dark Tower with some of the other exciting activities in our huge indoor family entertainment center. 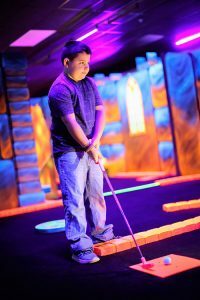 Host your Dark Tower Glow Golf BIRTHDAY PARTY ! Fantastic for ages 4 and up. We feature large Papa John’s pizza for Only $12 each – plain or 1-topping. Or send us your details by using the link above.